From the desk phone, press Hold soft key button during a call. For the One Talk DECT IP Cordless Phone select Options (right soft key) > Hold. From the mobile device, tap the active call icon to continue the call. Tap Retrieve to pick up the active call. On the desk phone the line key shows a flashing red light while caller is on hold. 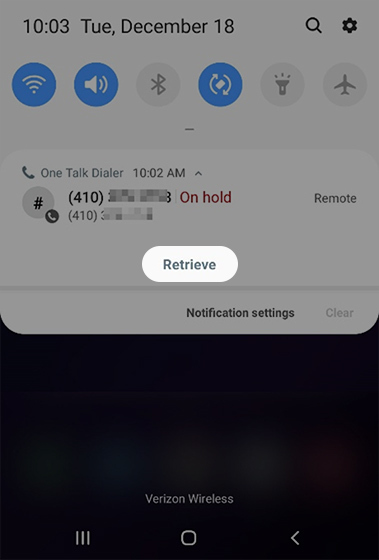 If using the Samsung Galaxy S9 / S9+ Enhanced Dialer, the call is retrieved from the notification panel. Swipe down from the top of the screen to open the notification panel. Swipe down on the One Talk notification (shows the call on hold). From the mobile device, tap the Phone icon. From the mobile device, enter **11 to continue the call. From the mobile device, tap Hold during a call. Pick up the handset and press the Line key button on the desk phone to continue the call. On the desk phone, the line key shows a flashing red light while caller is on hold. For the One Talk DECT IP Cordless Phone select the Line (right soft key) then select the line on hold to continue the call. From the mobile device, tap and hold MUTE for 5 sec during a call to place the call on hold. Pick up the handset then press the Line key button on the desk phone to continue the call. For the One Talk DECT IP Cordless Phone, select the Line (right soft key) then select the line on hold to continue the call. 'Move Call' is not available on Android® Basic Dialer.